Tomah the 115-lb. 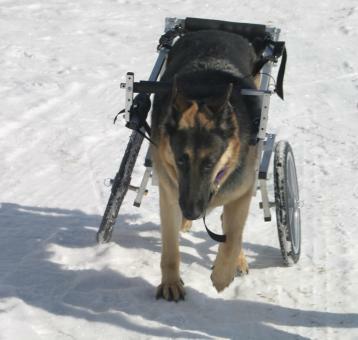 German Shepherd tries out his new cart in the Colorado snow! Homer in one of my older designs, recovering from a 2003 accident with much TLC from Neva! Tupper checking out our cat in the house! Sheba strutting on the sidewalk! 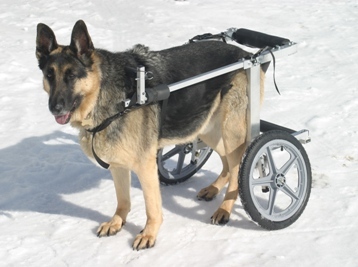 Zeus, a large, gentle Rottweiler, trying his quad cart. 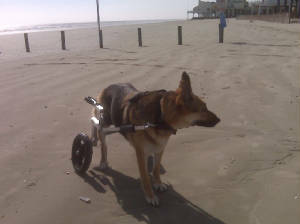 Sadie on the beach in Texas! Sadie is a beautiful German Shepherd. Raks, one of my original customers from 2004. 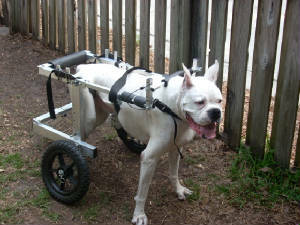 Tupper posing in his new cart, Feb. 2008. 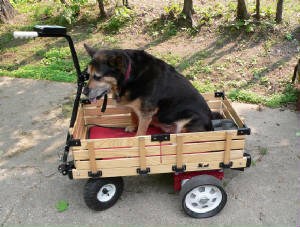 Patty liked her owner's pull-cart best! Boxer Tae in a counter-balanced cart. Duffy (left) got to walk with his puppy friend! The late Raks, a 105-lb. 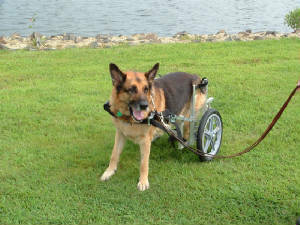 German Shepherd, was one of my original aluminum cart owners and many design improvements can be credited to him and his owner. Raks took his cart full-speed over curbs and once hooked a wheel on a wooden signpost, bringing him and cart to an abrupt stop. Surprisingly for all of us, he didn't break his cart! Zeus, a big gentle 130-lb. 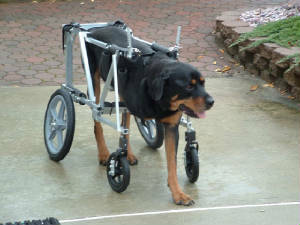 Rottweiler (right front leg amputee) had a custom quad cart. 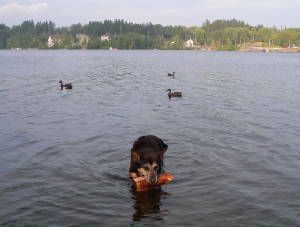 Zeus' owners drove down from upstate NY a few times, showing their devotion to their beloved dog. 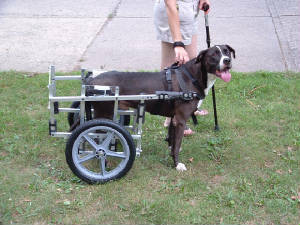 Sadly Zeus succumbed to the cancer that took his leg shortly after getting his cart. 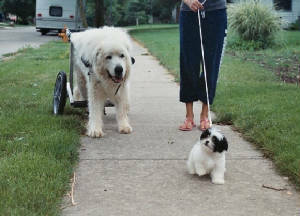 Patty (passed away 2008), who was stubborn about her quad cart, preferred the pull-cart her owner Rene pulled her around in! 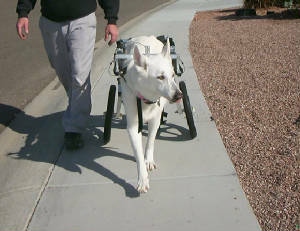 Sheba (also passed 2008), a beautiful white Shepherd, enjoyed walks through her neighborhood thanks to her owners Joe and Linda. 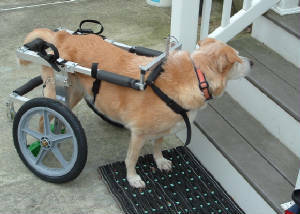 Duffy (passed away 2007), one of the original testers of my Collapsing Cart. 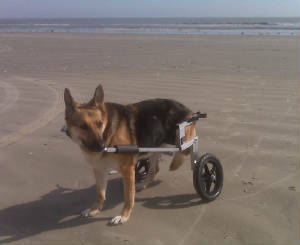 Chewbaka (passed away 2007), a recent user of the Collapsing Cart. His cart then went into use for another family dog. 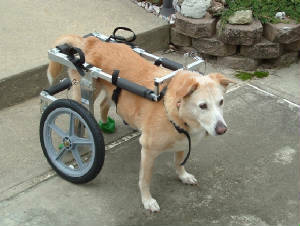 I honor those dogs that have passed Over The Bridge; it was a priviledge to build carts for them and meet the owners that loved them so.